Presentation in an event organised by the Greek Ministry of Press. 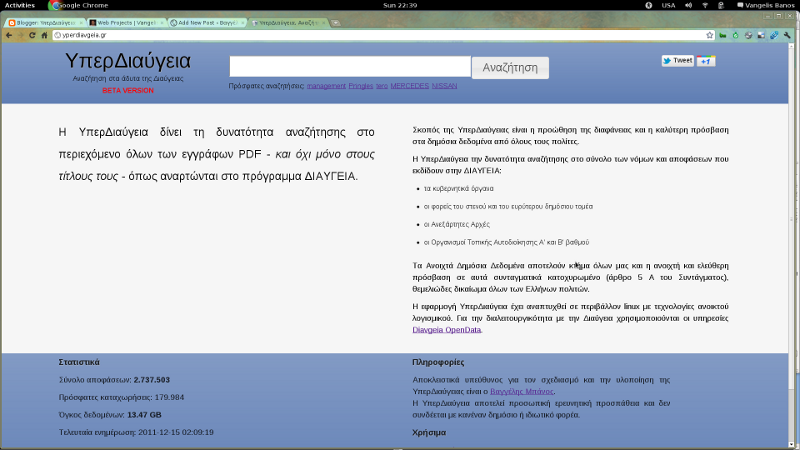 Yperdiavgeia.gr enables full text search in all Greek government data published via the “Cl@rity” Program: Every Government Decision on the Internet. Beginning October 1st 2010, all Ministries are obliged to upload their decisions on the Internet, through the «Cl@rity» program. Cl@rity is one of the major transparency initiatives of the Ministry of the Interior, Decentralization and e-Government. Henceforth, the decisions of the public entities can not be implemented if they are not uploaded on the Clarity websites, each document is digitally singed and assigned a transaction unique number automatically by the system. 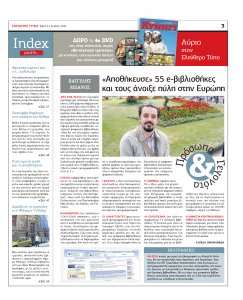 Interview about Greek digital libraries, openarchives.gr and metadata aggregation.